First off – don’t panic. 🙂 Keep drinking your coffee while you read this. A judge in California has ruled that coffee companies have to display a warning that coffee poses a cancer risk, due to the presence of acrylamide, a chemical produced in the roasting process. It’s true, too…this is nasty stuff, discovered in 2002. Lab studies have shown an increased risk of cancer, though the levels used around 1,000 to 10,000 times higher than what people would be exposed to in food. It’s not just in coffee though…it’s found in potato chips, bread, cereals, french fries, cigarettes, even canned black olives. California has a law, though (Proposition 65) requiring consumers to be informed if the product they’re buying contains dangerous chemicals…hence this court ruling. So…sure, acrylamide can cause cancer at high levels…but so can a lot of other things we are exposed to. Read more about acrylamide at the American Cancer Society if you’re interested. No camping trip is complete without a good cup of coffee in the morning! This is even more important when backpacking, as your surroundings are so idyllic that enjoying good coffee just caps off an already magical experience. With that in mind, this review is focusing on my quest to find a really good backpacking mug for coffee and tea. There are a few basic criteria any cup must meet. First, it must be at least partially insulated…it gets cold in the mountains of Colorado! Second, it must have a lid for sipping. Lastly, it must have a handle that I can use to clip it to my pack if I feel like it (translation – if I’ve packed too much and don’t have space for the mug inside my pack 😉 ). Shown above are my two current favorites. 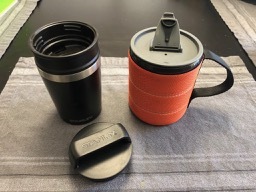 Let’s start with the orange one, The GSI Outdoors Infinity Backpacker Mug (starting at around $10 at Amazon, depending on color). The soft outer shell doesn’t provide a ton insulation, but does prove sufficient. it holds a cavernous 17oz, and has a sturdy lid – while the lid is just a friction fit, it’s snug doesn’t come loose. Another nice feature is that the plastic inner cup is removable and you’ll notice it has markings on it for up to two cups. This is especially useful if you’ve packed dehydrated meals and need to measure out hot water for those! All in all, a robust, quality mug that I used a ton last summer. 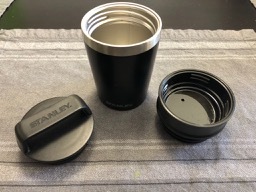 New to the game is the Stanley Adventure Vacuum mug, a story double-walled stainless steel option. At around $15 at Amazon, it’s more expensive than the GSI, but I have little doubt it’ll last longer. It’s really tiny, with a measly 8oz capacity, but what drew me to this, apart from the double walled stainless construction, was its clever lid system. There are two lids…one a sippy lid, the other a solid lid with a handle that a carabiner can easily clip to. You can use either lid, or – this is the clever part – both lids at the same time. So when packing, you screw the sippy lid on first, then the solid lid, and you’re good to go, with no concern about anything coming loose and falling off along the trail. 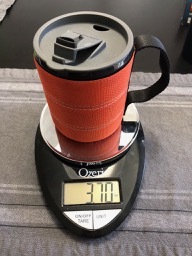 The GSI Outdoors Infinity Backpacker Mug weighs in at a featherweight 3.7oz. It really is light, especially for its size. Plus, it has a second function, to measure liquids to re-hydrate meals. Bonus! Ah, but then we get to the Stanley Adventure Vacuum mug, and its rugged construction really shows on the scales. This mug holds half the amount of the GSI, but weighs more than twice as much! 8.5oz, that’s just over half a pound! So, this is really more of a long term review, of my favorite coffee making machine! 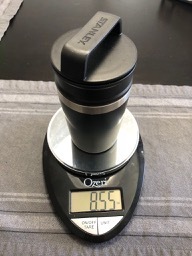 It’s called the AeroPress (~$30 at Amazon), and if you think it’s basically a French Press…well you’re right…but looking at it the wrong way. Meaning…it’s more like an upside down French Press! Here’s how it works. Stick a filter in the black cap part, screw that to the sleeve, add coffee, and set it on top of a cup. Add hot water…wait…then use the plunger to push the water out, into the cup. Similar to a French press so far, but now it’s time for cleanup…unscrew the black cap…the coffee grounds stay inside, just position over a compost container, push the plunger, and eject the coffee grounds into the compost. Rinse the parts, and enjoy your coffee! It’s quick, easy, and produces great tasting coffee. 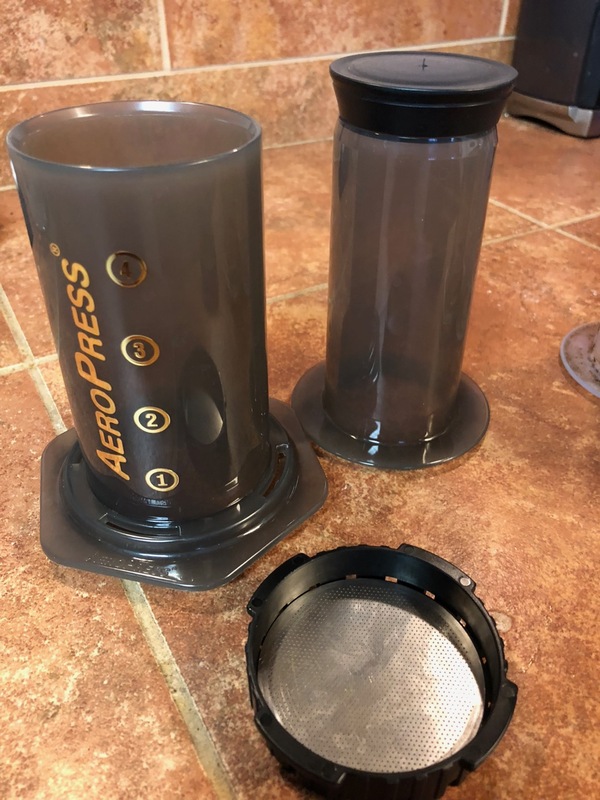 Now, the filter…in the image here I’m stainless steel filter…this is an optional accessory I bought (<$15 at Amazon); the regular AeroPress comes with a few hundred disposable paper filters. Disposable is not my thing, so I opted for the reusable one (though I’m stuck with 350 paper filters that came with it…I’ll either use them up, or find some other use, I don’t want to just throw them away!). 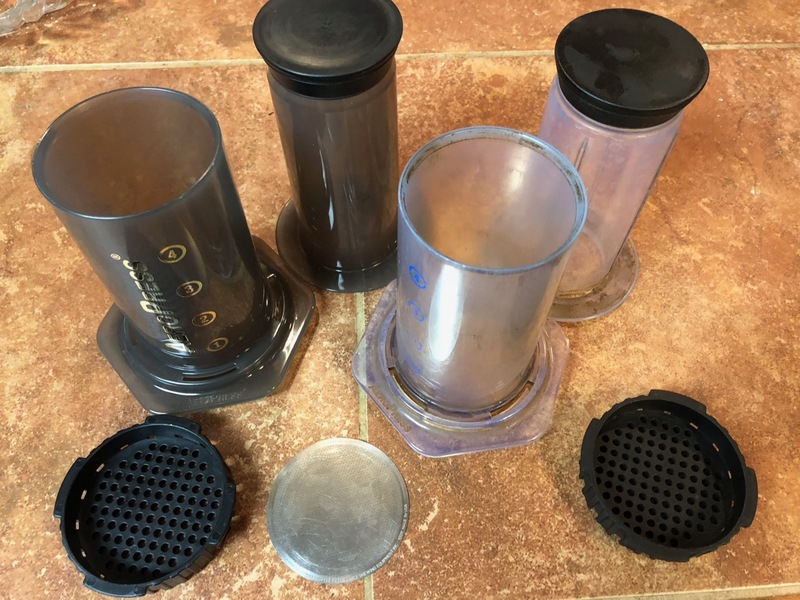 Also note my picture has two AeroPresses…well, my original finally wore out (the clear one on the right), after over five years of heavy use. The plunger seal deteriorated and won’t hold pressure, so it makes it tough to push the coffee out…and since the pressure you apply can affect the flavor, it was time for a new one. The design hasn’t changed much…you can see they’re now using a tinted plastic (probably to hide coffee stains if you just rinse it instead of washing it), and the plunger doesn’t have the exterior ribs on it anymore so is a bit of a looser fit in the sleeve (with no noticeable impact on performance). Other than that, it’s the same. Some people get pretty obsessed with technique…precisely measuring the coffee, or water temp, or even *inverting* the press during brewing. You can have a lot of fun with these, but they don’t require that level of obsession to produce great coffee! If you’re looking for an unbreakable, convenient, easy to clean way of making coffee, get an AeroPress! And my name is Matt, not Max, dammit! I’m such a coffee geek, I’m surprised I don’t write about coffee here more! I’ve maintained a separate blog called Coffeeopolis where I used to direct that attention…but in the interest of simplifying life I’ll be favoring this one instead. Today’s coffee fascination is with a new coffee drink called Bulletproof coffee. When I first read about this, I wasn’t sure what to make of it, and I quickly moved on to other, more pressing matters (like, you know, work!). It seems to be popping up more and more though. So, what is Bulletproof coffee? It’s designed by Bulletproof Exec, one piece of the puzzle to upgrading ‘your performance in every aspect of life.’ Noble ambitions. Why mess with coffee though? This coffee drink is part of a larger diet that gets pretty complicated…so click that link if you want to know more, but for now, just know that it’s designed to be more of a breakfast replacement. So, how do you make it? You start with one cup of coffee, brewed with 2 1/2 heaping teaspoons of low-toxin coffee (I hear that any wet-process coffee meets this criteria, though you can of course buy special Bulletproof Coffee Beans…). Add 1-2 tablespoons of a medium-chain triglyceride oil, 1-2 tablespoons of unsalted grass-fed butter, and mix it all in a blender for 20 seconds (you can buy a starter kit of ingredients for $50). Click here for a printable instruction card. So what’s it like? I wish I could tell you. Or not. I haven’t decided if this is something I want to try…I love coffee…and this sounds…weird. What’s gotten me thinking more about it, though, is this article at Fast Company. The author drank Bulletproof Coffee every morning for two weeks, trying it as a true breakfast substitute. The results were interesting and the article is worth checking out. Or check out the video below for instructions for how to make Bulletproof Coffee yourself. Perhaps the greatest problem astronauts face has been solved – Lavazza has designed an espresso machine which the Italian Space Agency intends to send up to the International Space Station! Astronauts can now enjoy a shot of espresso in the mornings, though due to the microgravity environment, they’ll be forced to sip it from a plastic bag rather than a ceramic cup. But hey, small price to pay for the ability to drink espresso while enjoying one of the most magnificent views in the solar system! If Bigelow Aerospace manages to build their space hotel, I wonder how long it’ll be before Starbucks opens up their first orbital coffee shop? 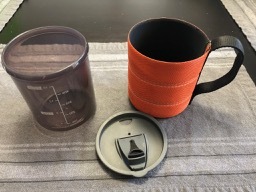 If you love the convenience of Keurig K-cups, but recognize the wastefulness of these, then you might want to check out refillable K-cups like this Ekobrew. The stainless steel construction should help it last a long time, and you can fill it with any of your favorite ground coffees. It can be bought for $17 at Amazon, or there’s also a plastic version available for just over $8.